CHICAGO today is a city without a citywide plan to address youth violence. Its current efforts to address youth violence lack coordination and cohesion and are largely unclear or unknown to the vast majority of Chicagoans. For Chicago to address youth violence effectively, Chicagoans need to see in place a citywide plan. They need also to be able to participate actively and constructively in that plan. This plan should be at least as well known to Chicagoans as are current plans to renovate Wrigley Field: plans which are routinely receiving front page or lead story in Chicago's mainstream newsmedia. FULL STORY is phase one of CCM's media-driven, citizen-participatory SAFE CITY project to give Chicagoans such a plan. 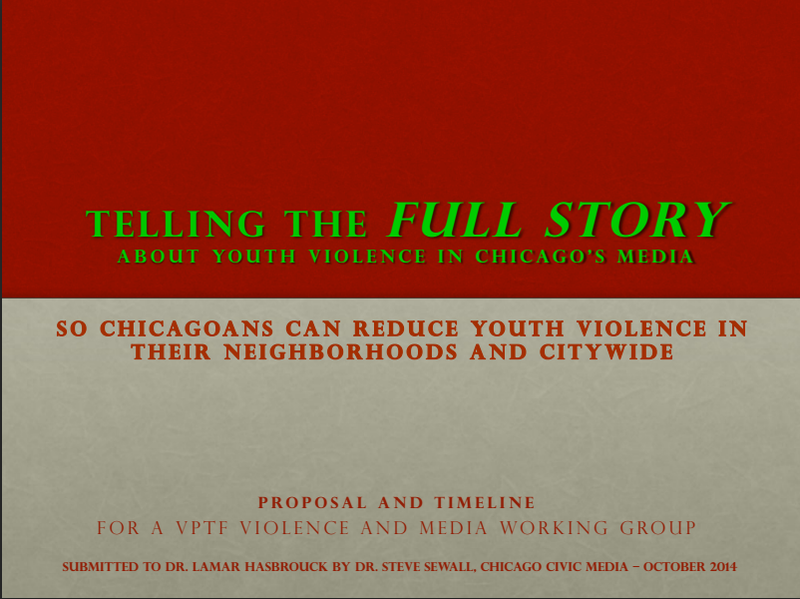 It seeks to empower Chicagoans and the city's media to create a citywide youth violence plan. 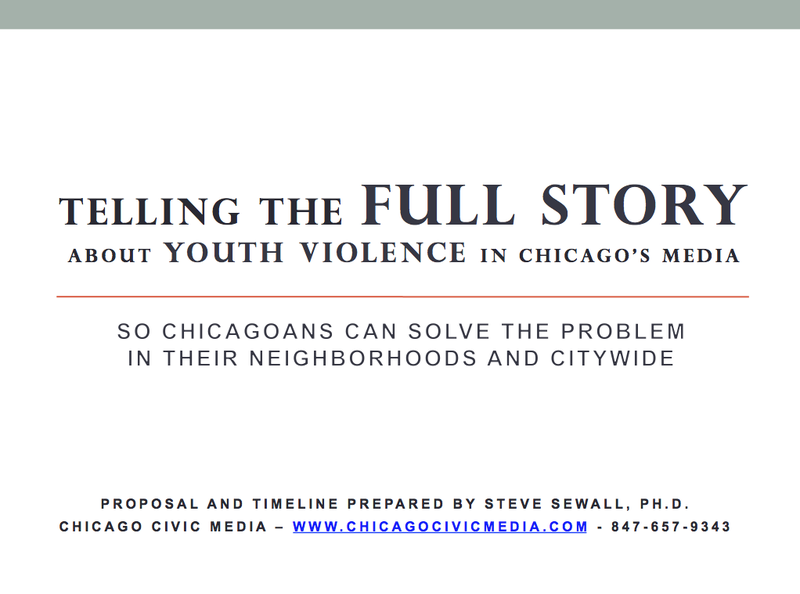 It draws on CCM's 30 years of experience in connecting Chicagoans to address youth violence via innovative uses of the city's mainstream and community media. It furthermore rests on the premise that Chicago media will profit handsomely and benefit the city substantially when they use interactive capabilities to help Chicagoans solve youth violence. FULL STORY's two components - a media component and a database component - are described below. Attractive, iconic FULL STORY content highlighting resources drawn from the YRD will supplement existing Crime Story coverage of youth violence in all members of Chicago's print and electronic media that opt to make use of it. Media that consult the Youth Resource Directory be able to supply their audiences, including residents of a neighborhood affected by a particular episode of youth violence, with resources on which they can draw to address the problem in their neighborhood. Full Story was conceived as a solution to the information bottleneck that keeps Chicagoans in ignorance about scores of life-saving resources now available to them in their neighborhoods. These are resources that Chicagoans can use to reduce violence at home, at school, and in their neighborhoods. The information bottleneck is especially severe in Chicago's highest crime neighborhoods. FULL STORY has two components. How FULL STORY took shape. In 2014 I attended two meetings of the Illinois Violence Prevention Task Force (VPTF) at the invitation of State Representative La Shawn K. Ford. This Task Force was created by Illinois statute on August 7, 2013. * Prior to Governor Rauner's election last November, VPTF was chaired by Dr. LaMar Hasbrouck, Director of the Illinois Department of Public Health. At these meetings I raised the question of the roles to be played by Chicago's powerful mainstream media in informing, inspiring and mobilizing Chicagoans to reduce youth violence in their neighborhoods and citywide. Subsequently Dr. Hasbrouck invited me to a meeting at which we discussed the utility of a VPTF Violence and Media Work Group. Its mission it would be to support Chicago's mainstream media in supplementing their existing "Crime Story" of youth violence with "Full Story" coverage designed to empower Chicagoans to reduce youth violence at home, at school, in the street and citywide by giving them access to existing resources of which most Chicagoans (including public officials) are often completely ignorant. Dr. Hasbrouck also invited me to make the case for a VPTF Violence and Media Working Group at the next VPTF meeting. In October, I sent him the "Full Story" Power Point proposal. The topic of "how violence is covered in media" was mentioned on page 2 of the November 20,2014 VPTF annual report that Dr. Hasbrouck submitted to Governor Quinn. That next meeting has yet to occur due to the change in gubernatorial administrations. I hope it will, given that VPTF was created by statute on August 7, 2013. It would be gratifying, to say the least, to see Democratic and Republican administrations cooperating on the urgent to give Chicagoans (and all Illinoisians) full access to all of existing violence reduction resources that are available to citizens in their communities. Presently I serve Rep. Ford as hisCommunity and Family Engagement Advisor. Here is combined CV and Chicago Civic Media archive. The Full Story proposal is currently being advanced to several groups. opportunities for at-risk youth so as to prevent them from committing crimes.